All smiles at the podium! There you have it, the Wadsworth Sista-hood each poised on “race” day for our respective Olympic distance events at Fort Richie – located in Cascade, MD. 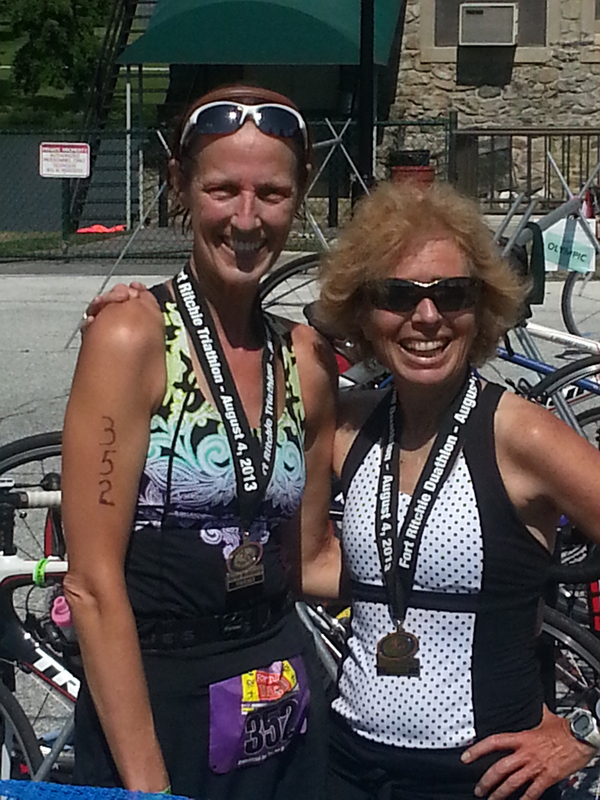 Sista Jill – would be taking on the Triathlon – which consisted of a 1.5K swim + 40K bike + 10K run, and I would attempt the Duathlon, consisting of a 5K run + 40K bike + 10K run. We proceeded to get body marked – where your bib number appears on one leg – and your age on the other. The rationale for broadcasting your private information (age) to a bunch of athletes you’ve never met — is to identify those in your age category – and turn them into your competitors. Or something like that. In an unusually cool mid-summer morning with the air temperatures ranging from the 60s to low 70s – the water temperature registered at 73 degrees. 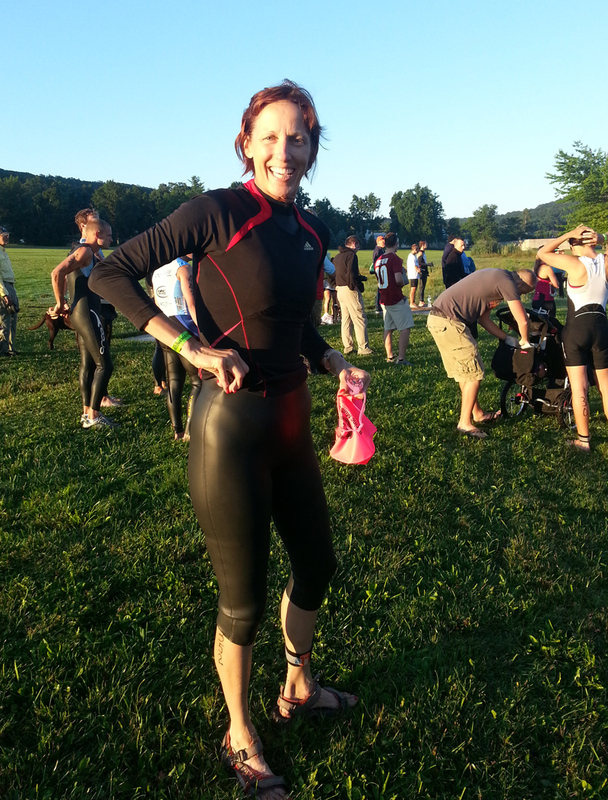 Anything below 78 degrees, makes the swim leg of the triathlon ‘wet suit legal’. This immediately put Jill in her ‘happy place’. Wet suit = extra buoyancy = float higher in the water. It also means that when you look out on the swim course and wonder why they allowed a motor boat to be on the same course with the swimmers, well, that’s no motorboat! Meet Jill. More on that in a moment. The duathlon event started 25 minutes before the TRI. This gives Jill more time to spend with her pre-race jitters, and gives me a head start on the ‘day plan’. I lined up with my peeps. The start whistle blows and the runners sprinted! I thought this leg was a 5K – and not a 100 yard dash?! I fought the temptation to sprint (as if I could!) with them, and opted to stay at my pace – slow n steady. Within the first mile, I had passed a few older men and even a handful of women, but the bulk of the runners were long gone. And then there was #51…a women. Someone in my age category. Someone I did not know. I scoped her from behind. I needed to pass her. I did. Now I needed to stay ahead of her. And, suddenly my event that started as the ‘day plan’ turned into an all out competition with some women I’ve never met. 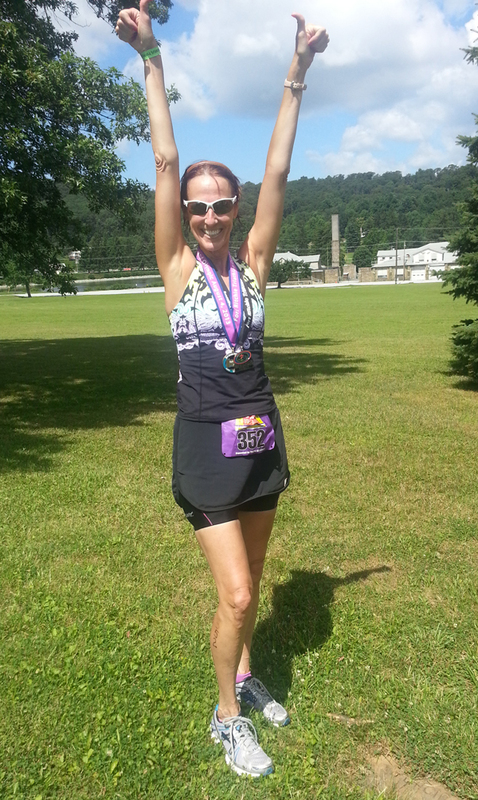 By the time I finished the first run leg – Jill was beginning her swim. Without a wet suit, Jill swims like a fish with a motor….but WITH a wet suit – she is practically airborne! The swim course is actually a funky swim-run on land for a tad-swim course. Basically, the swim course is designed for the shorter Sprint version – so as the sprint swimmers were exiting the lake, the Olympic distance swimmers had to exit too…and then run across the Fort Richie lakefront to the nearest dock…and dive back in again for their second lap. From the transition area, I thought I heard waves crashing on the shoreline – only to discover later that swim-motor-Jill was burning up the swim course. She swam the entire distance in an amazing 34 minutes. I don’t think she even came up for air. With the 1st leg of the run now over, I managed to have a fast transition onto the bike – and made sure to pack some food and electrolyte jelly beans in my waist pack. You never know when you’ll get hungry! I haven’t seen my nemesis #51 – so I wasted no time climbing the first hill away from Fort Richie. Realize that you have to go BACK the way you came…so better enjoy the descent! And WHAM….#51 BLOWS by me during the rolling hill descent. I’m no match for her on the downhill – so opt to just keep the girl in my sight. I’ve started strategizing on catching her on the uphill. So much for the day plan. As I return from the 10 mile farm loop toward the main road – I see Jill just beginning this loop and keeping pace with all of the zero-body fat male athletes with the $10,000 bike wheels. “You go girl” we yell to each other, and I watch momentarily with awe as she keeps up with the boyz at her 100 rpm Tour-de-France cadence. With Jill outta sight, it’s time to refocus onto #51, who is now within passing distance. I wait until we reach another climb, in the hopes that she won’t be able to stay with me…and make my pass. Now I have to stay ahead of her (not sure why? but I do!) for the 8 mile ascent and return back to the Fort. Back to the transition area, I rack my bike and begin the final leg of the event — the 10K run. The legs are a bit mushy at first, but within 100 yards – light feet return. The first mile + of the run is uphill, so I’m breathing heavier than I would like. No sign of #51 yet, so I have to sustain this pace. For the final 10K run, we have to do 2 laps on the same course. This means, as you NEAR the finish line after your first lap…don’t think about it – and turn the other way. 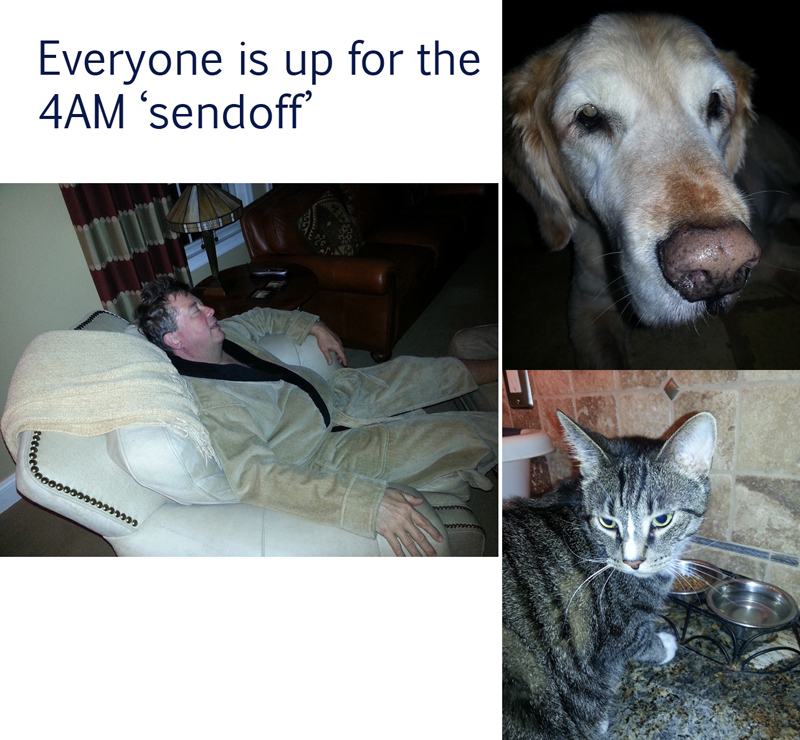 You have another lap to do. It’s all mental at this point. Jill had shared with me 4 jelly bean electrolytes – and I had eaten 3 of them during my first lap. Was holding on to #4 for lap 2. Turns out that wasn’t the best strategy – as the jelly bean morphed with sweat in my palm – and turned into a sticky mess. Live n learn! Still no sign of #51 (i.e. she hasn’t passed me) – so I amped up the pace of the last mile for added assurance – and was happy beyond belief that I had finished before the day was over! Moments later – I watched Jill finish her first run lap – and begin lap #2. I’ve never seen Jill with such giddy-up in her run! She was even smiling and talking – and if you have ever run with Jill before – that is rare! The run has been her least favorite event — but it seems like for today — she has made friends and peace! 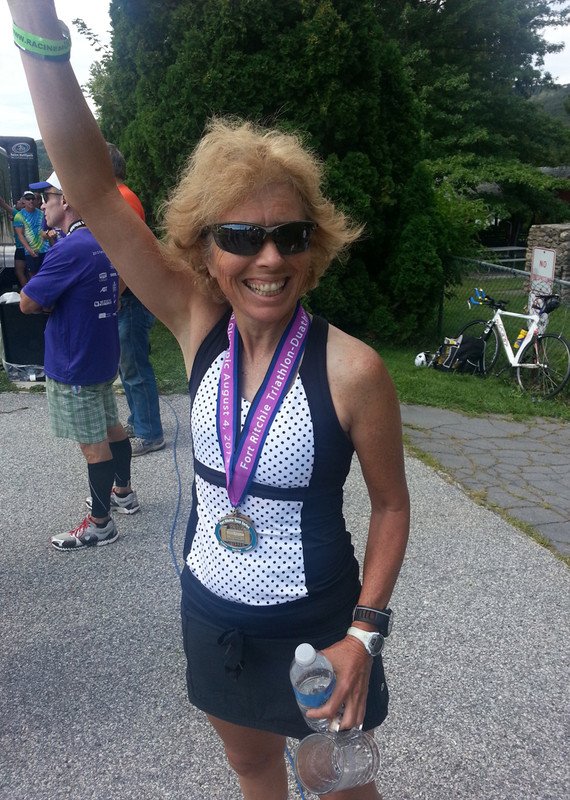 30 minutes later — Jill sprints across the finish line – beating her prior PB in an Olympic Tri! All the pre-race anxiety was long gone – and there were smiles everywhere. I met my nemesis #51 – a lovely lady – and we vowed to look for each other in the next event. As for an added bonus – Jill and I each earned a spot on the podium for our efforts!! And earned the right to eat whatever we wanted (within limits!) for the rest of the day.